This lithograph by John Doyle, a popular political cartoonist, dates from the early years of Queen Victoria’s reign. Depicted as an inn keeper, the young queen welcomes four pantomime characters into her castle at Windsor, which has been renamed the “Crown Tavern”. But what does the cartoon held in the St George’s Chapel Archives and Chapter Library signify? “Comic pantomime – curious metamorphosis” is one of the most ludicrous compositions of the series. 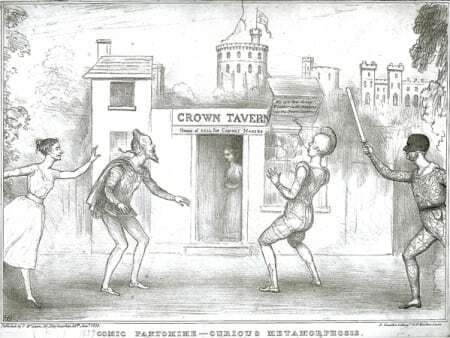 The Queen at the door of Windsor Castle, changing, under Harlequin’s wand, into the Crown Tavern and House of Call for Cabinet Makers, is surrounded by Lord Melbourne as Harlequin, Lord J Russell as Columbine, Lord Palmerston as Pantaloon and Lord Morpeth as the Clown. The whole scene is most grotesque: and the characters executed with infinite drollery. * I am grateful to Dr Nicholas Hiley, Head of the British Cartoon Archive, for this information.